This CD is full of all-new, never-before-released material. Hilary did it BACKWARDS this time! You won’t be hearing live versions of previously released songs, you’ll hear all new songs, recorded for the first time, LIVE! You have to hear this CD for such glowing moments as the amazing harmonica solo in track #5, ‘Last Day of Our Acquaintance, (you’ve got to hear how Hilary and band ‘convert’ this Sinead tune), Hilary’s piano/vocal version of one of her fans’ favorites, “Calls From Springfield,” and the amazing Zeppelin-esque vocal/electric guitar call and response of “People on a Train.” ‘Come In Come In: LIVE’ is one of the most successful “experiments” of her career to date. 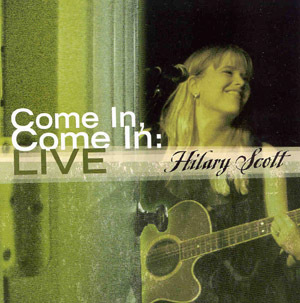 This live album was recorded in a one-hour session in a studio environment with fans of Hilary and her band there to create a venue feel. These ten songs, with their energy, passion, and full sound, catch the listener and don’t let go.